← Quiz ; KFC stands for …..
You can tell alot about a man from the car he drives…. The car hunt is over. After a couple of weeks of searching the yards, the streets and random locations like the Lucky Lucky Supermarket where I found myself leaving notes on windscreens with smileys on them “Interested in Selling your car ? 😉 “, I closed on a car yesterday. It came down to the choice of two in the end, both at an ask price of $15,000. 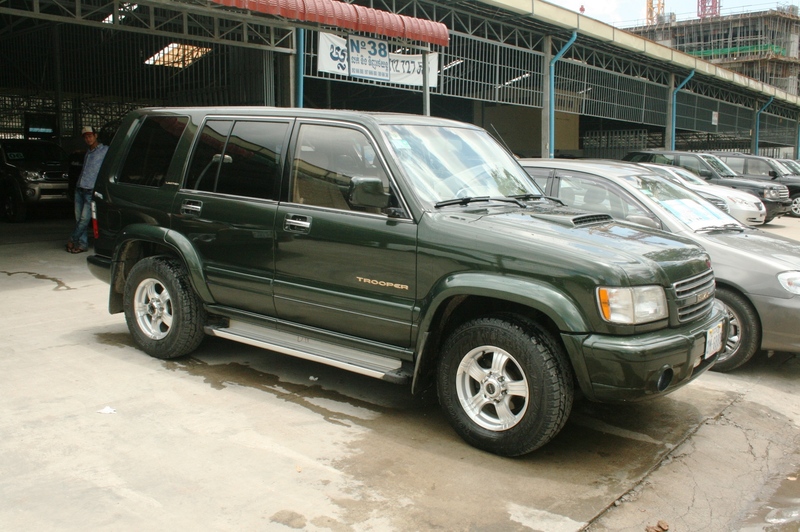 2001 Isuzu Trooper 3.0l Turbo Inter-cooled Diesel. Auto. Mica Green with tan leather throughout. 140,000km on the clock. This car was very nice with electric everything, a massive sunroof ( problematic if they start leaking ) and heaps of get up and go thanks to the turbo engine. The leather was a bit grotty in places and it was hard to tell whether that could be cleaned up being tan.The Khmer owner had also re-sprayed the console molding a rather diso-ish silver whereas it had originally been black. There were also some rather disco LED driving lights installed. The first time I drove this car I liked the performance but was not sold on the overall appearance as it seemed a bit Chav to me. I am not a huge fan of mica green and with its gold….yes….GOLD lettering I was a bit perturbed. The next day I drove it again and I actually warmed right up to it and decided that yes, it would make a suitable car. A little bit of elbow grease required to bring it back to a slightly more original state but nothing I could not handle. 1996 Toyota Landcruiser HJ80 GX Diesel Manual ( ex Saudi Arabia ) .240,000km on the clock. I drove this car a week ago when I first started looking and it presented very nicely indeed. Everything was in order , the cloth seats were immaculate, the carpet clean, the tyres brand new, the duco in excellent condition , the rear AC blowing strong and cold etc. For a diesel it drove very nicely too. Nowhere near the turbo oomph of the Isuzu but then it was not a wet sponge either. I had actually written off the LandCruiser autos as the couple I drove were painfully slow . This manual truck has a lovely smooth ride to it and the Toyota diesel clacking away was just music to my ears. I had an English diesel mechanic I know check both cars out and both cars as far as he could see were straight and with no major worrying mechanical issue. He was absolutely slathering over the Isuzu as he loves the engines in them and he said he had never seen one in this condition before. He said if he had the money that would be his choice. But he also thought the LandCruiser was a top car too. Simple,proven Toyota beef without the luxury trimmings. So which one do you think I chose ? Well…my family has always driven LandCruisers. I learnt to drive in our first FJ40 and dad went on to own a couple more. 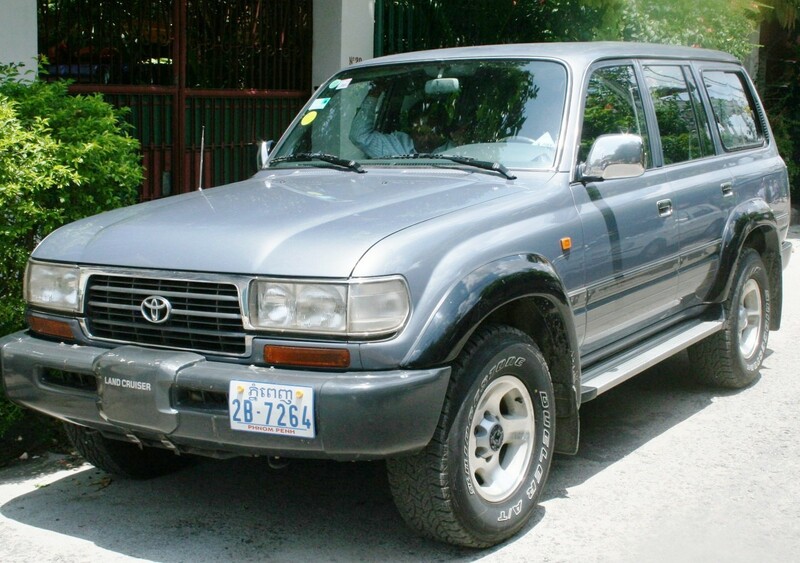 My brother-in-laws have owned them and I have always ALWAYS wanted a diesel LandCruiser – especially the 1996 80 Series GX which in my mind is just the duck nuts of cruisers. I just love the strong utilitarian appearance, the go-anywhere ability and the safe feeling they give you. So when my mechanic gave this car the thumbs up my heart soared and I made and offer on the spot and after a bit of haggling I got it for $14,000. The guy was not going too low as he knew what he was sitting on – probably the best 80 series diesel in Cambodia at the moment;-). Sure, I am paying way more than I would in Australia and sure, it does not have leather this and luxury that and blah blah that I could have got with a $10,000 Lexus 450 ( in gas guzzling petrol ) BUT its a very clean,safe,comfortable car for me to tool around in for work and for the ever expanding family and dog to go away in. Amazingly, the owner gave it to me to take home on Friday afternoon having only paid a $2000 deposit !! I told him he would need to wait until Monday for the balance and he said ” that’s cool just take the truck as I am going away and you might want to use it ! !” CLASSIC Cambodian business transaction. Stay tuned for details of pimping that will be done..
4 Responses to You can tell alot about a man from the car he drives…. Congrats. Equally happy with my little Sportage. Potholes in front of Footprints now navigable. My car is bigger than your car. In all seriousness – that Footprints road has just disintegrated AGAIN ! That would be Bong Krusty. Mate that road is leaning my decision to NOT send Grace there. Too narrow and busy hence dangerous for stopping and if the kids run out onto the road *doink* and then we have the surface issue. If i want to go off-roading in the new truck i will go to Koh Kong – I’d need to factor a new set of springs yearly into the annual tuition cost.